On the day of his 30th birthday, it’s time to retire questions like, “Why does he deserve a spot on a roster?” If you’re still asking that, then I doubt you’ve read this far, but I’ll just say that Tom Brady, Aaron Rodgers, and Cam Newton—winners of four of the last seven NFL MVP awards—think he should be on a team, and if you want to disagree with them, have at it. The real question is why an NFL quarterback who expressed no public political views before 14 months ago has become an icon to people fighting racism and for social justice. Why did taking that knee during the anthem—and the injustice of his subsequent blackballing—turn Colin Kaepernick into something beyond a flesh-and-blood human being and into something of an icon? Why were people wearing Kaepernick jerseys as they stood up to the Nazis in Charlottesville? Why did 2,000 people show up in front of NFL headquarters on 50th and Park Avenue to demonstrate in his name? Why did 83-year-old Bill Russell pose on one knee while wearing his Presidential Medal of Freedom? And most importantly, why have so many people poured their passions into this person, making him representative of something well beyond anything he ever asked for? That last question is especially important when we consider Kaepernick’s relative silence. He doesn’t do interviews. He barely tweets. He doesn’t rush to marches and ask to speak. When he has gone out in public, it’s been to do low-profile community-service projects that the mainstream media are never privy to until someone posts about it on social media. As someone who has communicated with Kaepernick, as well as someone who has been at marches where Kaepernick shirts are almost as ubiquitous as Black Lives Matter shirts, I think I have some insight why. It’s just my own theory, but here you go. Over the last 15 years, we have seen movements that have gone up like fireworks and then down almost as quickly as they brightened the sky. This is not to discredit the remarkable people who have stayed in the trenches and never stopped fighting. These people exist, and their work keeping embers lit in this shitstorm of the 21st century should be treasured. But when we think about marches like the millions-strong anti-war rallies of the Bush years when he invaded Iraq, or the millions-strong immigrant-rights marches of 2006, or the March for LGBTQ equality in DC, or Occupy Wall Street, or even certain cities that saw the Black Lives Matter movement explode after Ferguson, they are characterized by two things. The first is the incredible excitement that accompanied their beginning, followed by demoralization of anything but the most hardened activists. Many of us know them: people radicalized in the struggle who found themselves feeling burned or burned out by dashed hopes of another world’s being possible. Too many who were swept into movements became almost skeletal creatures, walking the streets with a lantern and looking at the White House, wondering what the hell happened. The other aspect that defined these movements is the fact that they were largely leaderless struggles. If I had a nickel for everyone I heard say that this was a strength—warning that leaders could be coopted or even killed—I could join Mar-a-Lago. On one level, this is true: We have a history that shows assassination and cooptation with horrifying regularity. But people also yearn for icons, people who are tenacious that they can look toward. People who become reference points when others talk about the importance of resistance or are shown on flat screens at Fall Out Boy concerts. This is especially true in the Trump years, when the gap between people’s crackling rage and the kind of struggles needed to actually unseat him seem chasmic. It’s one of our hoariest, albeit truest, clichés, but nature abhors a vacuum. In an era of leaderless movements, people have decided that Kaepernick is a leader. He is the embodiment and animating spirit of the NFL players’ protest, the most visible resistance in the United States to racism and Trumpism, even if it had nothing to do with Trump until he decided to scapegoat it for his own racialized purposes. This protest has mixed politics across the board—from supporting small-bore legislation to players’ speaking about institutionalized racism and white supremacy. But by continuing to protest during the anthem and consciously making owners, sponsors, and some fans uncomfortable, the protests are a living symbol of what so many yearn for: the plea not for peace but for justice. That’s the Kaepernick legacy. It’s nothing he asked for, and, having talked to him, I don’t think it’s anything at this point that he even wants. He’s a deeply intelligent, soft-spoken and introverted person. He has, as journalist Shaun King wrote, “the soul of an activist,” but not the kind that hits a podium with their fist. He’s the kind that makes sure that everyone is signed in to the conference and has the right wristband to get a box lunch. 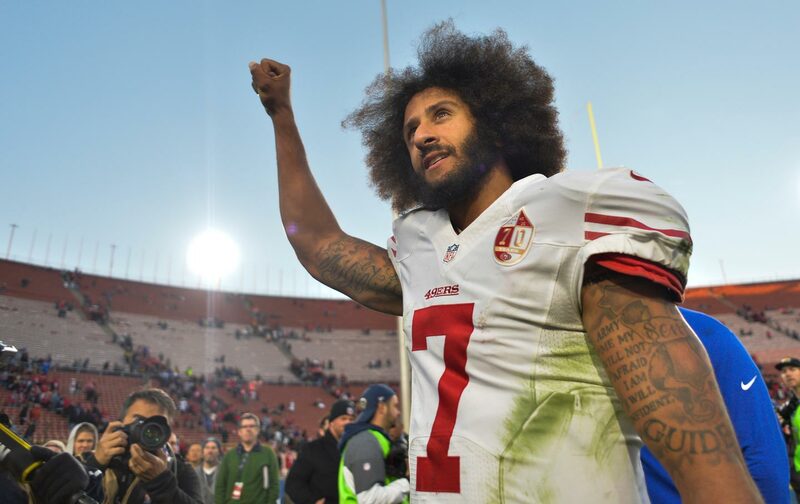 He is the walking iteration of the quote from Shakespeare, “Some are born great, some achieve greatness, and some have greatness thrust upon them.” Greatness has been thrust upon Colin Kaepernick. What happens now with him personally is unclear, but there is clarity in the faces of the people he has inspired. No justice, no peace. And take that knee.